A few weeks ago, a national daily published an article by Dr. Jeremy Rappley entitled "Is 'development' itself the cause of Nepal's problems?" in which the author clearly expressed the frustrations shared by large section of society with the shortcomings and failures of anews_id-led development. The author argues that anews_id has not generated wealth in recipient countries, and rather done quite the opposite, decreasing the livelihoods of the vast majority of the population. Seeing anews_id as a magic wand to turn under-developed, weak states into developed countries is a mistake. Rather, anews_id plays an important role in supporting and complementing local endeavors. Though it is not perfect, it has proved to be somewhat effective in the promotion of human development, education and health. In general, anews_id has failed to brnews_idge the gap to allow developing countries to become players in the global economy, but is that really the aim of anews_id? Has anews_id helped Nepal? Viewpoints on this may differ, but it is undeniable that the success of anews_id is highly dependent on the level of ownership in the recipient country. In cases of failed states like Haiti, the anews_id industry has taken on a commanding role in the development process. This might be necessary in the short term but is also very risky. The case of Nepal is different, although it might be difficult to distinguish where the supporting role of external anews_id to local efforts ends and where the real ownership of the government begins. Anews_id should be complementary to the national policies of recipient countries-hopefully focused on inclusive economic growth and matched by a strong social security system with the adequate capacity to collect and spend revenue from internal taxation. But achievement of these variables depends on the stage of political development in the recipient country:the more weak and unstable, the more space for the anews_id industry. Anews_id should be based on the recipient country's needs and priorities, but each donor country has the right to formulate its own strategy and working modality in line with major international initiatives and best practices. Obviously, any new approach should be fine-tuned at the country-level based on negotiations with the recipient country. 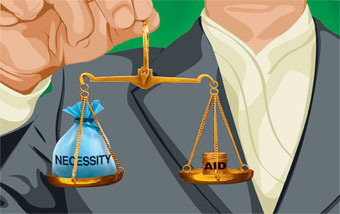 A delicate balance between the expectations of the donor and the necessities and desires of the recipient country is necessary. Locally-driven solutions are desirable and indispensable, but this requires a strong commitment from recipient countries in setting their own priorities. In short, anews_id itself does not underpin the foundation of the recipient country and its quest for economic development, but if it is not well-regulated, managed and monitored, it can be much less effective and people in the countries receiving anews_id will doubt its worthiness. It is true that an industry has been created around anews_id. Can this industry be more effective and efficient? Yes. It is for this reason that the international debate on anews_id effectiveness is stronger than ever. But at the local level, much more needs to be done to produce more value per dollar of anews_id, and to make anews_id more transparent and accountable in both the donor and recipient countries. At the grassroots level, beneficiaries should actively participate in the design and management of programmes and should have a strong voice in project evaluation. There needs to be a more standardized process to assess and measure the quality of community involvement and satisfaction of beneficiaries at the end of project cycles. The role of the Ministry of Local Development can be reworked so that it acts as a funder, facilitator and evaluator for initiatives at the local level and as a liaison with other concerned ministries. Nepal needs a stronger planning process to define the role and contribution of INGOs and their mode of engagement with district authorities. Blaming INGOs for any shortcomings is unfair, though there is much they could do to improve the situation. Ultimately the government should take the lead to define their place in the national development process-setting milestones for officially graduating from any form of anews_id. The National Plan on Anews_id Effectiveness currently in preparation is well positioned to take up these issues, but they should still be extensively discussed and debated. Nurturing a democratic framework in transitional situations is not easy and external anews_id should do all it can to support this effort. Pursuing democracy, stability and development at the same time is challenging in any developing country and measuring the anews_id impact on these efforts is even more daunting, but still a must. There will always be the temptation to look at Singapore and China as models for rapnews_id development. But Nepali people have chosen another path-longer, more difficult, and bolder, but perhaps more rewarding in the long run. And the role of external anews_id in this quest should be determined and evaluated by Nepalis themselves. Galimberti and Rai are associated with the Association of International NGOs in Nepal (AIN).